Every Company shall have a gateman Secretary, so says the HR Manager law in Section 293 of The Companies and Allied Matters Act, CAP. C20, Laws of the Federation of Nigeria. By secretary, I do not mean a receptionist or a customer care practitioner; neither do I mean a person who just assists with correspondences or making appointments nor that stern looking woman who sits in front of the Executive- Director’s office and acts like she’s the gate-keeper to the Promised Land. By Secretary, I mean a corporate officer in charge of the official correspondences of the company, minutes of board meetings, and records of stock ownership and transfer. 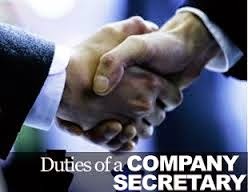 A company secretary is appointed and can be removed by the Directors of a company, and like the Directors of a company, the secretary plays a very important role in the company’s daily administration. The part played by the Company Secretary is further strengthened by the Corporate Affairs Commission (CAC) directive that all companies appoint a Company Secretary and file evidence of same before the commission. d. Carrying out such administrative and other secretarial duties as directed by the director, or the company. Register of members and shareholders. Index of members where they are more than 50. Register of interest in shares. Furthermore, a secretary shall not owe fiduciary duties (duty to act with good faith) to the company except where he is acting as its agent, then he shall owe fiduciary duties to it, and as such shall be liable to the company where he makes secret profits or lets his duties conflict with his personal interests, or uses confidential information he obtained from the company for his own benefit (Section 297). To be a Company Secretary, such person must have the requisite knowledge and experience to discharge the functions of a secretary, and in the case of a public company, he shall be either a member of the Institute of Chartered Secretaries and Administrators; or a legal practitioner; or a member of the Institute of Chartered Accountants; any person who has held the office of company secretary for a period of 3 years; or a corporate body or firm consisting of the above mentioned people (Section 295).